Lavardin C62 review | What Hi-Fi? There are many reasons not to buy the Lavardin C62/AP150 pre/power pairing. Here's just a few: it's expensive, doesn't have remote control and though well made lacks the luxury build expected at this premium price. There's more. If you listen to vinyl, the matching phono stage is £383, moving magnet only design; most people who buy at this price level are likely to have exotic moving coil cartridges. But for all the negatives, this French pre/power combination turns out to be one of the highlights of our year. Why? It sounds utterly brilliant. Or maybe ‘convincing' is a better definition. It doesn't go massively loud or deliver a sound of immense scale – a power output of a mere 50 Watts per channel sees to that – but this pairing delivers sound in such a direct and uncluttered manner that even tracks as complex as Thelonious Monk's Played Twice make perfect musical sense. Firstly, the Lavardins organise things brilliantly. Every instrument and sound has a place, and nothing is disturbed or overlooked as musical complexity rises. Add this innate stability to exceptional handling of timing and dynamics, and you have a rock-solid platform for other hi-fi qualities to shine. This Lavardin pairing's way with dynamics is as capable as we've heard outside amplifiers that sell for mortgage money. Their ability to convey the nuance of a voice is spellbinding, yet in the next moment they can deliver explosive transients without restraint. The ability to combine the subtle with the sledgehammer is something few rivals can do. Even rarer, is the ability to time properly. Only a handful of the products we hear each year have a proper mastery of this aspect of sound. Yet this ability is vital if a component is to convey low-level shifts in the momentum of music or reveal the interplay of instruments properly. Of course, excellent timing is vital to deliver a full dose of rhythmic drive too. The Lavardins get all these spot-on. Once a component has the basic foundations right other qualities tend to follow. This pair's detail resolution is excellent, as is its ability to convey a precise, expansive stereo soundstage – something brought clear into focus during a rousing well-recorded rendition of Mahler's Symphony No.1. The Lavardin's final party trick is the ability to combine a total lack of harshness with a treble performance that lacks nothing in openness, bite or brilliance. There's nothing clinical or mechanical about the presentation: it's full bodied without sounding soft and fluid without sacrificing precision. Lift the Lavardin lids and at first all is as we'd expect: careful circuit board layouts, quality components and sensible power supply arrangements. But look closely and you'll see small black box boxes on the main audio boards. These are the most sensitive part of an audio circuit, and they're designed to compensate for transistor memory distortion. System matching isn't particularly difficult – the AP150 power amp will drive most speakers to decent levels, despite its low power output. Just make sure your speakers do justice to the amps' amazing range of abilities. We got good results with our reference ATC SCM 50s, plus Mordaunt-Short's Performance 2s, but a demo is essential. 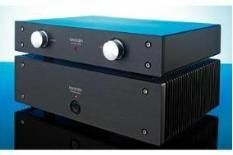 The amps work with many types of cable, but of all the options we tried, they clearly sounded best with Lavardin's own designs, which cost a hefty £1055 for a pair of interconnects and £2505 for a set of single-wire speaker cable. Again, an audition is key. If sound quality and musical enjoyment are your priorities, you'll find this Lavardin pairing hard to beat at this price. Dismiss them at your peril.